A while back I was playing golf with a friend. It was a gorgeous day with no wind. We should have been having a great time, but one of us was not having fun. My friend was shanking almost all of his shots. Although I had heard of the shanks, I had never witnessed it firsthand. My friend was trying to be a good sport and not let his frustration show, but I could tell his inability to hit the ball straight was bothering him. I tried to take photos and videos of his swing to help us assess was going wrong. We didn’t figure it out that day on the golf course, but once I got home, I reached out to our local golf professional. He graciously let me interview him and we built a Cause Map together. 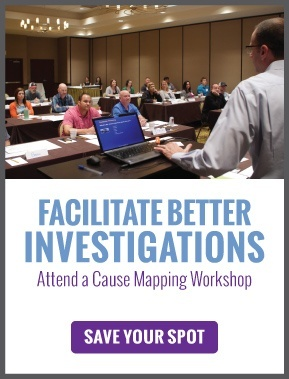 Cause Mapping is a root cause analysis method that improves the way people analyze, document, communicate and solve problems. A Cause Map provides a visual explanation of why an incident occurred. It connects individual cause-and-effect relationships to reveal the system of causes within an issue. I now know that there are two ways you can shank a golf ball and what causes each: hitting the ball off the club’s hosel and hitting the golf ball off the club’s toe. Let’s take a step back and examine the parts of a golf club head. 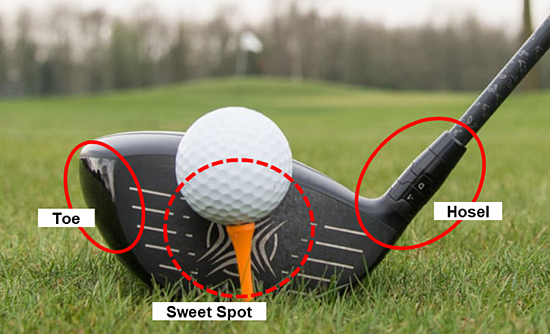 There are three important areas to define to understand golf shanks: the hosel, the toe and the sweet spot, shown in the image below. The goal in golf is to hit the ball with the sweet spot of the club face while keeping the club face perpendicular to one’s body. Hitting the ball with an open face means that the club face is turned away from the golfer, and a closed face is when the club face is turned towards the golfer. The hosel of the club is where the face of the club meets the shaft.  Most golfers set up their tee shot much like the image above, with the golf ball centered on the face of the club. Then they begin their backswing and proceed with a downswing, aiming to hit the ball in the sweet spot. Several things can happen with the body to shank the golf ball. First, the golfer’s hips move forward toward the ball during the downswing. In golf terms this is called early extension. This causes the golfer to hit the ball with an open club face and the path of the swing is moving from the inside, close to the body, towards the outside, away from the body. Early extension is caused by inadequate pelvic tilt. There are two causes of inadequate pelvic tilt. First, the golfer’s core is not strong enough to hold still and allow the body to rotate during the golf swing. Or second, the golfer does not understand the mechanics of good body position during the golf swing. Essentially, the golfer’s body is in the way of their own swing. The body, still trying to hit the golf ball, adjusts, resulting in hitting the ball with the hosel of the club. If you are right-handed, this results in your golf ball going 90° to the right of where you want it to go. If you are left-handed, the ball goes to the left. See the Cause Map below to view the root cause analysis example built out. When a golfer shanks a ball off the toe of the club, they are still hitting the ball with an open club face, but this time the path of the swing is moving from the outside, away from the body towards the inside, close to the body. This swing pattern is caused by the arms lifting during the swing so that the club is behind the body instead of above the shoulders. The open club face is also caused by the lifted arms and because of a lack of body rotation. Poor core strength strikes again. It can also cause improper body rotation. If you have the shanks or want to prevent them, then you may want to consider golf lessons. Lessons can help you understand the proper body mechanics that a golfer needs to consistently hit good shots. Someone with a trained eye can watch you swing, identify undesirable habits and then work with you to correct them. Stretching and doing exercises that strengthen the core can help prepare your body to be able to have a smooth proper swing. Next time you are on the golf course, tee it high and let it fly. And always have fun. 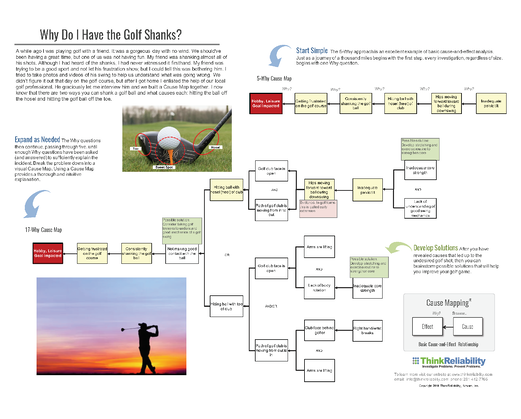 If you are interested in golf, you might want to check out this root cause analysis example where a golfer burned up the course…literally…by creating a spark when a golf club hit a rock.